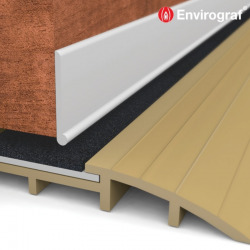 Envirograf Door Upgrade Paint System Packs allow users to upgrade solid wood/timber doors to up to 30 mins' fire resistance. 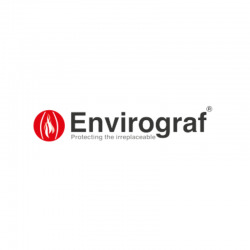 This Envirograf system offers a white or coloured solution (you can apply your own decorative top coat to colour co-ordinate a property) to upgrade solid wood/timber doors to up to 30 minutes' fire resistance (subject to suitability) by using Envirograf intumescent coatings. These packs offer the Envirograf paint system ONLY, if you require intumescent card, mastic, hardware, etc. for your doors please contact the Technical Department. This system offers a clear primer, white intumescent and white undercoat sufficient for 4m², 10m² or 20m² of door surfaces. Fire and smoke seals should also be fitted to each door upgraded. Remember, intumescent paint is just one element of protection and DOES NOT create a ‘fire door’. Intumescent materials and hardware MUST be used to ensure your doors meet the required standards of your authority. If you are looking for a clear finish, we also stock our Fire Door Varnish. Hi, I currently have some FD30 blank fire doors that I need to cut down to fit small doorways. Would it be suitable to do this and to then paint them with your paint to meet requirements? The only other option that I can see is custom made fire doors which gets expensive. I look forward to your response. Thanks! 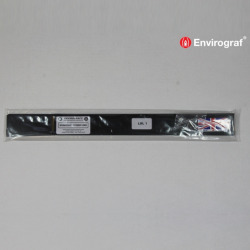 Providing your doors are suitable and meet the minimum requirements then you can apply our Envirograf Door Upgrade Paint System and obtain a certificate from the manufacturer following purchase and application. How do I get a certificate of supply for materials I purchased from yourselves. Simply complete and return the application form provided with the goods on delivery. Hello, please can you advise if both sides of the door need to be coated if the door opens into the hallway/escape route. Also, just to reconfirm that it's definitely fine to use a standard wood paint on top to match rest of woodwork, skirtings etc after using this system? Thank you. In general the manufacturers recommendation for this product is that doors only need to be coated on the room side (risk side) unless they are being used as a fire break within a corridor. However we do recommend you check with your authority what their requirements are for your project. Once the coatings have been applied you can go over with a topcoat of your choice, but we recommend carrying out a small test area first to ensure adhesion and compatibility. Assuming you have correctly applied the Envirograf Door Upgrade Paint System (Envirograf HWAP/WB Primer, Envirograf HW01 White Intumescent Coating and Envirograf HW04/S Undercoat) to suitable timber doors, then yes you can go over with a standard, decorative topcoat of your choice. We would recommend you carry out a small test area first to ensure adhesion, compatibility, etc. Question: What is the minimum door thickness to schieve fd30 with your kit? Please download and read 'Door Upgrading Technical Data' from HERE. No any existing paint does not need to be removed as long as it is sound, well adhering and not fire retardant. The substrate surface must be clean of all dust and dry. There should be no trace of oil, grease or similar substance. The surface should be sanded smooth. If timber is previously painted, ensure the surface is clean and sanded appropriately to provide adequate key. To protect 16 door sides to 30min fire resistance you would require 4 of our Fire Door Paint (30min) packs. Download our 'Fire Door Systems Brochure' from the 'DATASHEETS' tab on the product page to check your doors are suitable and seek approval from your authority for this system prior to purchase and application. Finally, you may want to check with your authority which side of your doors need protecting with our product as usually the 'risk' side would be the room side of each door, NOT the 'hall side'. The Fire Door Paint (30min) system is completed by the application of a white undercoat (included in the pack). This MUST be over painted and cannot be left as a finish. Conventional, single pack, decorative Water or Solvent based paints are acceptable to overcoat the undercoat to provide the colour and finish you require. One of our clients has considered using intumescent paint to upgrade ordinary office doors and the painter has told them they "only need doing on one side". Reading your guidance confirms that you recommend painting the "risk side" by which I presume you mean the side the fire is likely to be on? However for doors opening onto a stairwell either side could have a fire and therefore both sides should be treated with intumescent paint. Could you confirm this? As a principle though upgrading the doors is a good idea so subject to your confirmation of the instructions I would probably recommend to them to proceed. One of the advantages of our Fire Door Paint (30min) and Fire Door Varnish (30min) systems is that where deemed appropriate by the authority it can only be applied to the risk side of the door and still certified. That said, we do state in our product information (Fire Door Systems Brochure) that the user should seek guidance from their respective authority to ascertain which doors need to be protected in their property and on which sides. If you have deemed that your clients doors require protection on both sides then both sides should have the Fire Door Paint (30min ) system applied to them including any architraves, frames, etc. where required. This is why we sell the product by door sides rather than doors as a 4 door pack could upgrade 4 doors if only one side requires protection or 2 doors if both sides require protection. I trust this clears things up, should you have any further questions please do not hesitate to contact our Technical Team on 0113 2455450. Question: How long does this paint last? Does a door that has been treated have to be repainted every few years? How long can the paint be stored for once it has been opened? Once our Fire Door Paint (30min) has been used on the door(s) then it will last as long as the substrate. We recommend a re-application of a topcoat every 5-7 years just to ensure no damage occurs to the intumescent system underneath. Any damages to the door should be repaired immediately with the full system to the affected area. Once the tins have been opened the shelf life reduces to 3 months.